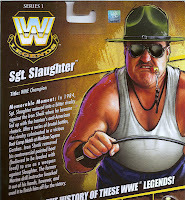 This is Slaughter's first and, to-date, only appearance in Mattel's WWE Legends line. The design team chose an attire I'm not at all familiar with. Being a child of the '80s and early '90s, I'm used to seeing Sarge in his more identifiable camo tights or army fatigue green outfits. Still, this figure definitely captures the essence of Sgt. Slaughter, albeit downplaying his G.I. Joe ties. Please note that the production figure does not feature the painted wrist tape, I've added those myself because I thought not only are his bare wrists inaccurate, but the look horrible with the elbow pads. Only a handful of Superstars can pull off that look (The Rock, Batista, to name a couple) and the Sarge isn't one of 'em. A little bit of Testors Model Master Flat White Acryl is all you need to give some wrist tape a lá Mattel. Slaughter is one ugly sumabich and the figure does a great job of capturing that. I dare to say it's probably one of the best likenesses in all of Mattel's WWE lines. Details like Sarge's balding head are captured in perfect detail and the paintwork on the head only stand to enchance the sculpted details. There are several paint issues with the rest of the figure, though. The edges of his tank top are a bit sloppy, sometimes not painted all the way to the edge, other times the paint spills on to the figure's "skin". The other issue is with the tampographed "CORPS" running down each of his legs. All the letters are clearly printed except for where the pegholes for the knee joints are. I'm happy to report that Mattel has improved on this since wave 1. The good sergeant receives the standard articulation model for the WWE Legends line and it works as it should for the most part. There are the usual limitation in the elbows, abs and hips, but nothing we haven't become accustomed to by now. Being a series 1 figure, Sgt. Slaughter comes packed with the WWE logo display stand and a cardboard name tag that fits into the front of the stand. Slaughter's true accessories are his hat, sunglasses and whistle. Sarge's classic drill sergeant hat, or campaign cover, is molded in green and featuring a stamped sergeant's insignia on the front and a painted black band wrapping around the hat just above the brim. The rank insignia is VERY rudimentary in it's design. It basically looks like a golden pie slice due to it's lack of detail. The sunglasses have Ray-Ban's Aviator-type lenses and are molded to fit perfectly on Slaughter's face. In fact, they won't fall off even if you hold him upside-down. The third accessory is a drill sergeant requisite tool: a whistle! It's on a lanyard, but both parts are one molded black piece with the whistle painted silver. Unfortunately, there isn't much give in the lanyard portion and even if there was, you can't place the whistle in Sarge's mouth. It still looks fine hanging around his neck, but it would have been nice to display him "mid-whistle". Considering the simplicity of Sgt. Slaughter's costume and accessories, I really wish Mattel would have added his trademark baton. I think it would have completed the figure, although I may have to consider the fact he may not have carried it around when he wore this outfit. I can't be sure either since I have been unsuccessful at finding even one image online of him wearing this attire. Sgt. 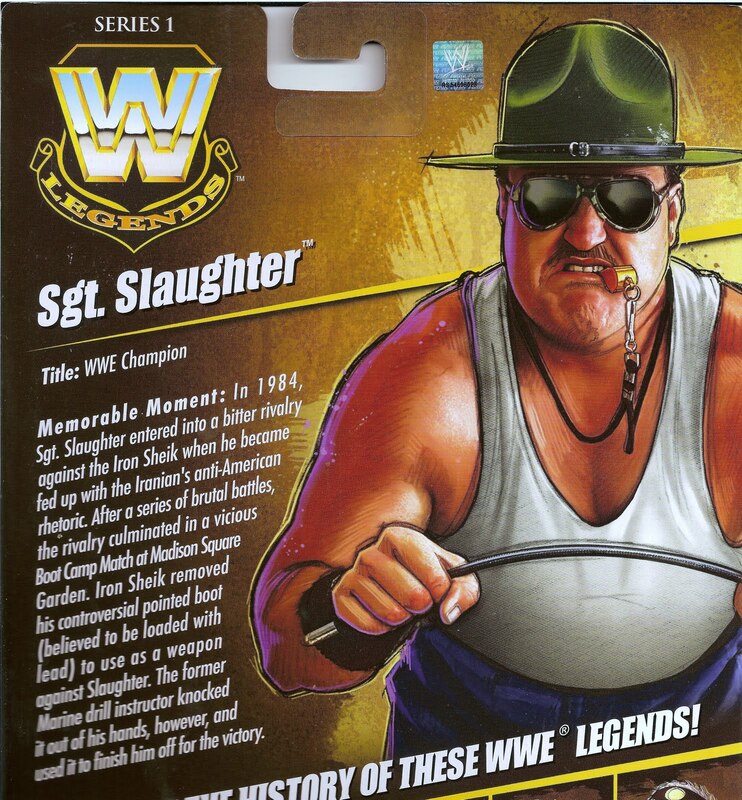 Slaughter is an overall solid entry into WWE Legends. I wouldn't mind having a version is his more militaristic look or even a G.I. Joe version, but that seems like a longshot. If you haven't already added him to your collection, check your local Marshalls, TJ Maxx, Ross or similar discount stores as early waves of Legends have been seen at lower prices. I've even spotted Legends figures on clearance at Target for as low as $4.00. This is most certainly the reason the line will be exclusive to MattyCollector.com next year, but Mattel only has themselves to blame for that. They flooded the market with series 1 and 2 and when retailers couldn't move those, they didn't order subsequent waves in as large amounts. Furthermore, desperate fans turned to online retailers to snag the newer waves and by the time those arrived at retail, many fans already had the figures. Toys R Us, notorious for overpricing action figures (DC Universe/Green Lantern Classics, Marvel Legends, etc. ), have actually lowered the price of Legends to $12.99, not bad considering they raised the price on Elite and Defining moments to $16.99 and 25.99, respectively. Even Walmart is currently selling Legends at $15.97. TRU's price drop was enough to get me to buy figures I initially skipped (Brian Pillman, British Bulldog and Akeem). I can only hope that Mattel keeps the price at $15.00 for the 2012 online series. I seriously doubt they can sell the line at $20.00 a figure like their Masters of the Universe Classics and Ghostbusters figures. At $15.00 I'll probably by all the figures, but $20 is enough to desuade me from an "average" Legend I may not be too into. Sorry for the long post today, I didn't mean to go on a tirade, but with all recent buzz surrounding Mattel and their DCUC Club "BUY it, or we'll have to CAN it" subscription and "lack of fan support" talk, I felt it was a good time to vent my feelings on one of my favorite action figure lines. Please feel free to comment!